I attended a party on the weekend and the video game Rock Band was the main focus of the night. For those not familiar with the game, four players are given a game controller that resembles a musical instrument. There’s a guitar, bass, drums and a microphone for the person who is brave enough to sing. The object is for the four of you to play a popular song by hitting the notes (which are in the form of colors) that appear on the screen. If you miss the notes the song sounds like crap, the crowd boos and you all lose. Of all the songs we played that night, the song “Don’t Stop Believing” by Journey was the stand-out. It wasn’t necessarily because it was anyone’s favorite song, but it was the song that brought us all together. Even the people that weren’t playing the game could not resist singing the memorable chorus “Don’t stop believing…hold on to that feeling”. 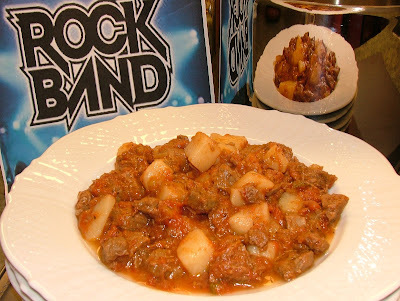 The next day I was in the kitchen preparing this stew and I had this thought that homemade stew has many of the same traits as the song “Don’t Stop Believing”. It's pleasing to our senses and is the type of dish that brings people together. I choose a beefy rhythm for this stew, followed by a melody of celery, onions and tomatoes. To add volume I used a beef broth and finally I harmonized it together using Italian seasoning, garlic and red wine vinegar. Although you never hear people say “my favorite food is stew”, it is a dish that everyone always seems to enjoy. The nice thing about this stew is it’s almost impossible to screw up and you’ll never have to worry about hearing a series of “boos” as a result of your efforts…which is very different from my Rock Band experience. Trim excess fat from beef and cut into ½-inch cubes. Pat dry with paper towels. In a large soup pot, heat 2 tsp of oil over medium heat. Add half the beef and cook until well browned on the outside. Remove beef from pot and set aside. Repeat the process with the remaining oil and beef. Add onions and celery to pot. Cook and stir over medium heat until vegetables begin to soften, about 5 minutes. Return browned beef to pot. Stir in flour, garlic and Italian seasoning. Cook and stir for 1 minute. Add tomatoes. Cook and stir, scraping up any brown bits from the bottom of the pot with a wooden spoon. Add beef broth, vinegar, pepper, salt and bay leaf. Bring to a boil. Reduce heat to low, cover, and simmer for 40 minutes. Remove bay leaf. Add potatoes. Cover and simmer for 40 to 45 minutes more or until beef and vegetables are tender (see cooking tip). Serve.